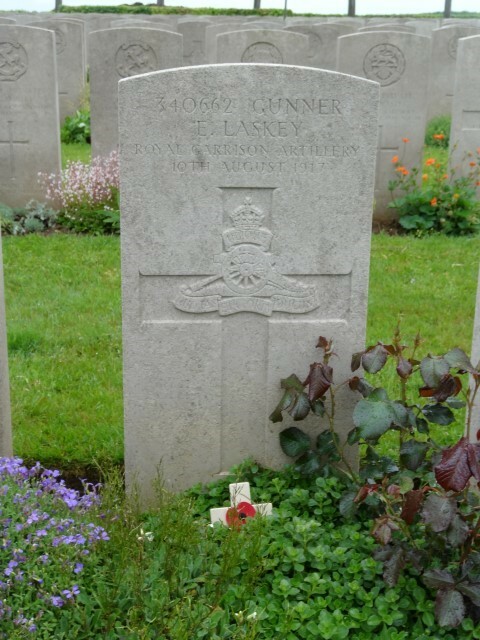 340662 Gunner Edward Laskey, Royal Garrison Artillery died of wounds 10 August 1917 and is buried in Duisans British Cemetery, Etrun, France. He was about 38 years old and is commemorated on the West Auckland War Memorial. In 1871 Edward and Mary Laskey lived at Blue Row (Eldon Lane, Bishop Auckland) where Edward worked as a miner. Edward died in 1880 and by 1881, 38 year old Mary, now a widow lived Metal Bridge with her 5 children. By 1911, the family lived 15 Catherine Street, Spennymoor and 31 year old Edward worked as a coal miner (hewer). Later, the family lived at Front Street West Auckland and then Mary lived at 7 New Street, West Auckland. 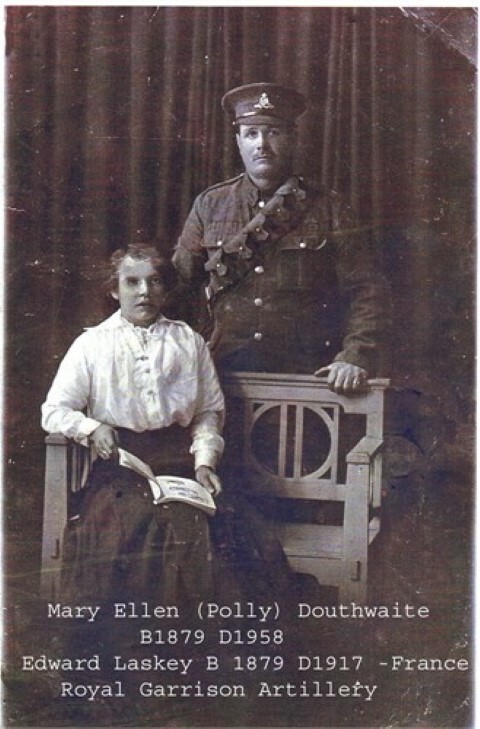 Edward enlisted at Bishop Auckland into the Royal Garrison Artillery and served with the Territorial Force, the Essex and Suffolk Battalion and was given the regimental number 340662. The battalion joined the 124th Siege Battery. The unit was formed at Portsmouth 22 March 1916 and entered France 20 July 1916. It was disbanded 4 November 1919. The service record of Gunner E. Laskey has not been traced. He died of wounds at 19th Casualty Clearing Station 10 August 1917. Siege Batteries RGA were equipped with heavy howitzers, sending large calibre high explosive shells in high trajectory, plunging fire. The usual armaments were 6 inch, 8 inch and 9.2 inch howitzers, although some had huge railway or road mounted 12 inch howitzers. As British artillery tactics developed, the Siege Batteries were most often employed in destroying or neutralizing the enemy artillery, as well as putting destructive fire down on strong points, dumps, store, roads and railways behind enemy lines. The armaments of each battery will be given as details are added. It is assumed that Private E. Laskey was one of the 6 men wounded that day. “For most conspicuous bravery and initiative. Under intense artillery fire, this officer, on his own initiative and under intense artillery fire repaired, unaided, the telephone line between the forward and rear positions, thereby enabling his battery to open fire on the enemy. 2nd Lt. Maufe further saved what might have proved a most disastrous occurrence by extinguishing a fire in an advanced ammunition dump caused by a heavy explosion, regardless of the risk he ran from the effects of gas shells which he knew were in the dump. The actions of Corporal Davis leading to his award have not been traced. 340662 Gunner Edward Laskey was awarded the British War and Victory medals. Gunner E. Laskey is commemorated on the West Auckland War Memorial and the Roll of Honour, Memorial Hall, West Auckland. By the end of the war he had achieved the rank of major. He died in 1942 while serving in the Home Guard.